So awhile back I tried out scootering and bikejoring with the local husky group! It was a blast! I wish I had some photos of it. It took me awhile to figure out I amsupposedto pull when in the harness, but I started sorting it out. My humans wanted to do this with me once they got home, so they were in need of purchasing a harness and bungee lead for the bike. 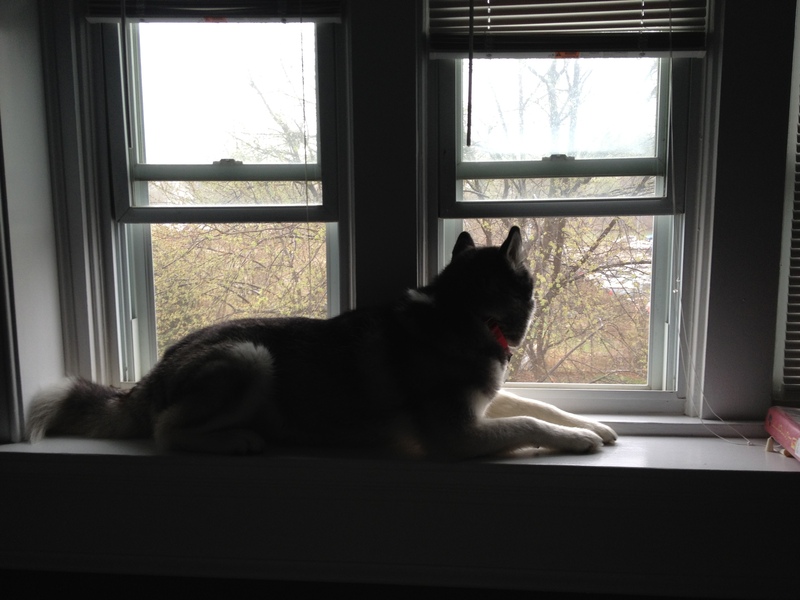 Low, and behold, the rescue Taysia Blue Siberian Husky Rescue has an online shop where they sell Howling Dog Alaska products! The proceeds from the shop go directly to the rescue! How cool is that?? Me sporting my new harness and lead! It is now storm season here in the Midwest and I wanted to share with you some useful tips for keeping your beloved four-legged friends safe during these storms. I got these handy tips from AccuWeather.com. 1. Bring your pets inside. If it’s not safe for you outside, it’s not safe for them. 2. Keep emergency pet supplies in a tornado-proof room or cellar or handy for emergency evacuations if you have to travel to a friend’s house or other storm shelter. Adequate supply of food, water, and treats and any medications your pet might need. 3. Make sure that your cat or dog is wearing a collar and identificaton that is up to date and visible at all times. 4. Practice getting your pets into the tornado-safe area. Do your best to train your dog to go to the area on command or to come to you on command even when there are distractions. Learn how to quickly and safely secure your pets. Find your pets’ favorite hiding places and learn how to safely remove your pets from them. 5. Make your tornado-safe area animal friendly. 6. If you have to evacuate, to take your pets and their emergency supplies with you. 7. Take special care of your pets after the tornado has passed. Make sure you have current photos of your pet in case of the unfortunate situation where they do get lost. Make sure you have some sort of arrangement for your furry friends should someone else need to care for them a short-while. In your human first-aid kit keep some pet first-aid items as well. Booties are handy in the event you need to traverse debris filled areas. My humans always keep a leash on me or within easy reach during bad weather. They are weather watchers and try to stay on top of the weather changes, but this is the midwest and it can happen very quickly. Stay safe my four-legged pals! It appears that the peregrin falcons that nest on top of the Woodmen Tower here in Omaha are back! I captured this screen shot this morning. 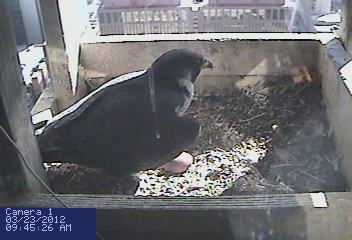 Looks like there is at least 1 egg in the nest! What do you think Khyra?? Will our falcons have a good year of chicks??? 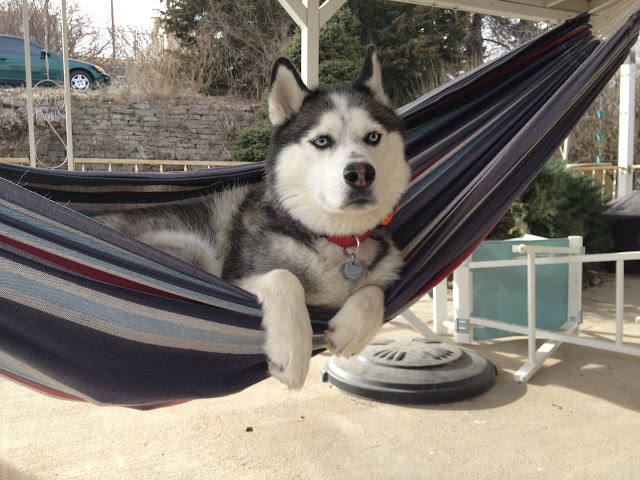 The weather is perfect for some hammock time! This describes the state of things in our house better than anything. Last night while out on my evening constitutional, there was an intruder in our yard. I quickly dashed over and pinned it to the ground with my mouth. The humans, sadly, called me off my “kill” and made me go back inside while they investigated. They initially thought I might have captured one of those pesky stray cats that frequent our yard. 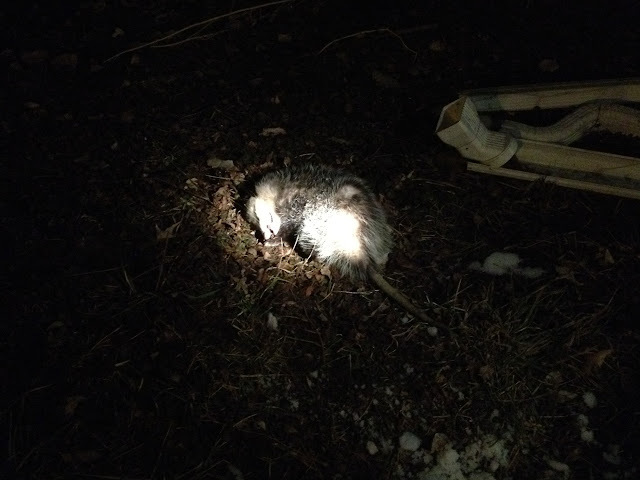 Indeed that is NOT a cat, but a stinky opossum! I was thoroughly convinced I’d protected my territory quite effectively and eliminated the threat. I confirmed on a later outside trip that I was incorrect in my assumption. Next time I’ll bite down harder. $5 or $10 can go along way to help my friends! North Wapiti "Pretty Sled Dogs"